Monsieur Racine is a retired tax collector. He lives in a sweet little cottage where he loves to spend his days tinkering in the garden and watching the clouds go by. M. Racine's greatest gardening treasure is his pear tree, with luscious fruit that has won many a prize at local fairs. Alas, one day, M. Racine wakes to see his precious, juicy pears gone. Rushing outside, he discovers one single pear remaining. Donning his old cavalry uniform, he ties the pear to a bell and a piece of string and waits to see if the thief will return. Late in the afternoon, the bell rings! M. Racine races outside to encounter the strangest being he's ever seen. A gentle, lumpy, sweet thing that loves macaroons and slices of pie. Each and every day, the silent creature visits M. Racine and they strike up a quiet companionship. And all the while, he studies the creature, determined to discover what it really is--a beast no one has ever seen or heard of. Taking his new friend to Paris for assessment, it becomes an instant sensation. He is offered money, fame and renown for the creature, by the zoo, the circus and wealthy maniacs, but before M. Racine can make a decision, something quite extraordinary happens with the creature. Quite extraordinary indeed. This is a magical story reminiscent of 'nonsense' tales from a master of picture book creator. 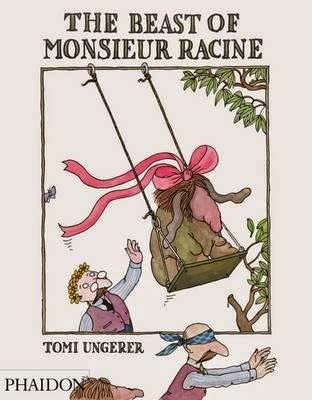 Iconic Ungerer illustrations make for a striking book that will reel kids in, making it a great story to read aloud.